Fundamental military alignments with US, taking place without open debate, may foreclose India’s options. Prime Minister Narendra Modi with US President Barack Obama. Is India approaching a pivotal moment in its foreign policy? 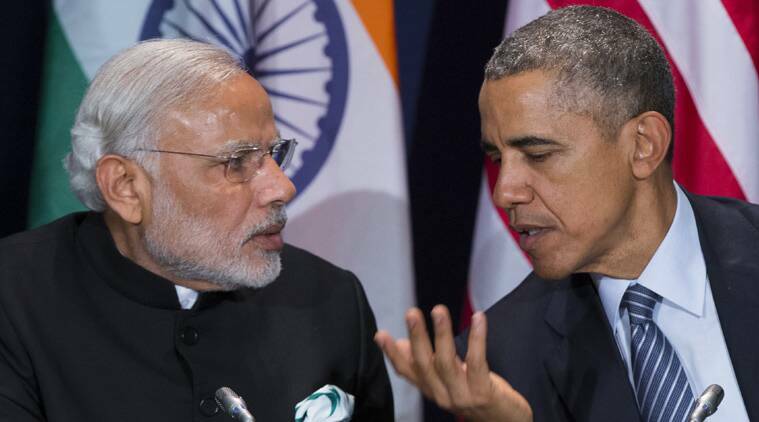 Will the emerging shape of Indo-US relations help or hinder India’s prospects? There has been a great deal of momentum in Indo-US relations beginning with the nuclear agreements. The depth of the economic, cultural, scientific and intellectual relationship between the two countries can be of unprecedented benefit to both. The question is: To what extent should this relationship be transformed into a deep strategic and military partnership? The debate in government over signing three possible agreements with the US — the Logistics Support Agreement (LSA), the Communications and Information Security Memorandum of Agreement (CISMOA), and the Basic Exchange and Cooperation Agreement (BECA) — has once again focused attention on this question. Will these agreements be Prime Minister Narendra Modi’s parting gift to President Barack Obama? Radical breaks in Indian foreign policy are rare. These agreements are in line with the trends the UPA initiated. But are we at that moment when, inchoately, quantity becomes quality, and we go down on a path that prematurely forecloses options? At one level, some of these seem to be prosaic agreements. For example, the LSA seems more of an enabling accounting agreement that facilitates mundane reciprocal uses of each other’s facilities. It does not, in any way, commit India to provide logistical or base support, though it is seen to be the thin end of the wedge towards that. But, taken together, these agreements signal fundamental transformations in India’s foreign policy thinking. For one thing, they will signal an unprecedented geopolitical alignment with the US. Second, there is a signalling of a deeper alignment of India’s defence future with the American military industrial complex. Third, there is a possibility, as the defence minister had suggested, of these agreements pushing India to unwittingly providing support to the US in conflicts that are not of our making, particularly in the Middle East. These are momentous shifts. They may be desirable. But it is a bit disquieting that these shifts are taking place without much public debate. There are too many distractions. But it has also become all too easy to represent any scepticism about military alignments with the US as fossilised remnants of old thinking; whereas, in fact, the unthinking embrace of the US also poses considerable risks. The US is making no secret of the fact that it wants to position India in its plans for China. But it is not in India’s interests to become a frontline state in that emerging faultline. Its interests have always been to do business with both countries so that both take it seriously. This is a sophisticated game. But an open declaration of a political and defence alignment with the US forecloses those options. We will come to be unwittingly identified with American rhetoric and designs for Asia. And the overblown rhetoric emanating from Washington about positioning India in its pushback of China will reduce our options. It is not an accident that except for an odd country or two like the Philippines, most Asian powers are still hedging. It does not suit our interests to jump the gun, as it were. There is this bizarre fantasy being woven of India as a great maritime power. We do have an interest in an open and accessible maritime order. But it is running quite ahead of reality to suppose that India’s immediate interests lie in aligning with America to extend our reach. For one thing, our capital investments in the navy make it too premature to think that we will be greatly using access to American bases. But, for a moment, assume a worst case scenario in terms of China’s stance in Asia: That tensions escalate, particularly in the South China Sea. Do we really think we will challenge the Chinese there with the Americans, when all that the Chinese have to do is take a little walk across our vast borders to make us feel vulnerable? Our job as a global power is to defuse, not escalate, tensions. India has also done well to avoid identification with many of America’s wars, and ideological constructions, particularly in West Asia. The Donald Trump candidacy portends a potential craziness in American foreign policy, but even a Hillary Clinton presidency portends a more interventionist foreign policy that might make us uncomfortable. The question is whether a more intricate operational embrace with the US will make keeping that distance harder. The US is a vital development partner for India. And, certainly, access to high-end American technology is not going to come without a price or without extracting commitments. We have to assess the costs and benefits of this ledger carefully. But the truth is that our interests do not necessarily converge with the US. On development issues, from trade to intellectual property to immigration, these fissures are likely to remain. The American military industrial complex does see the South Asian conflict as a potential bonanza; just witness the sale of F-16s to Pakistan. Some tactical intelligence help to India cannot detract from the fact that the Americans have helped sustain the institutional configuration in Pakistan that has arguably been detrimental to both India and Pakistan. So India’s defence ministry is right to worry about what our tighter defence embrace of the US might mean. A sophisticated engagement with the US is in India’s interests. But there is reason to worry that the escalating nature of our defence agreements with the US will put us on a slippery slope where we may not be able to manage our own geopolitical positioning in the world’s major conflicts. This is not a necessary outcome of these engagements. But what should make us suspicious is the fact that deep down, the Indian strategic embrace of the US has been born out of a psychology of defeatism: As if the US will be our crutch against China. And the Washington establishment that now has unprecedented access to Indian circles of power eggs on that belief. Modi’s great rhetorical gambit was the overcoming of defeatism. Yet it is hard to shake off the impression that this government seems a little keener to ingratiate India with the American foreign policy establishment. America will be India’s great civilisational friend; whether the American state should be so tightly embraced is still an open question. We need to at least debate this more openly before we set out on a path of no return.